Not clothes spread on a line for drying, as I first thought. 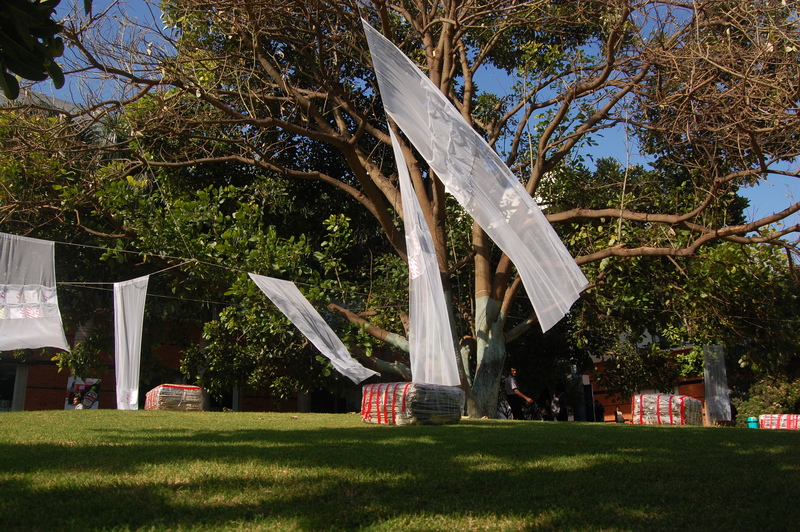 They were a kind of white net fabric, stitched on to criss-crossing rope in the lawns of Velankanni IT Park, Electronic City, the venue for this year’s Bangalore Literature Festival. On closer look, I see the pockets on each of the “clothes”, inside of which there are BLF branded postcards (?!) – yes, postcards, some filled and others empty. I speak to Bhavana Kumar, from Kumar La Noce Architecture, who explains to me that I could send a message to a friend, relative or loved one through the postcards, and the Bangalore Literature Festival would have them delivered. A nice gesture from a literature festival that is only in its second edition. Kumar and Nicola La Noce are two of the lesser known organizers of this year’s edition of the festival. 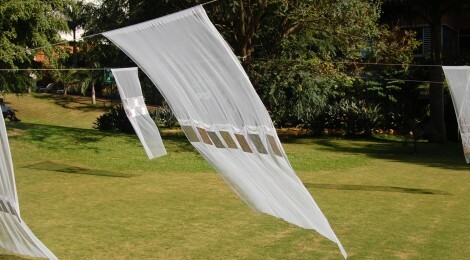 They are responsible for the installation I first mistook to be a clothesline. A while later, I am in the middle of a jam packed audience who have come – one might mistakenly think – to witness the city’s only known literature festival, but only to wilt away soon after the session that ended at half past three on that warm Friday afternoon. 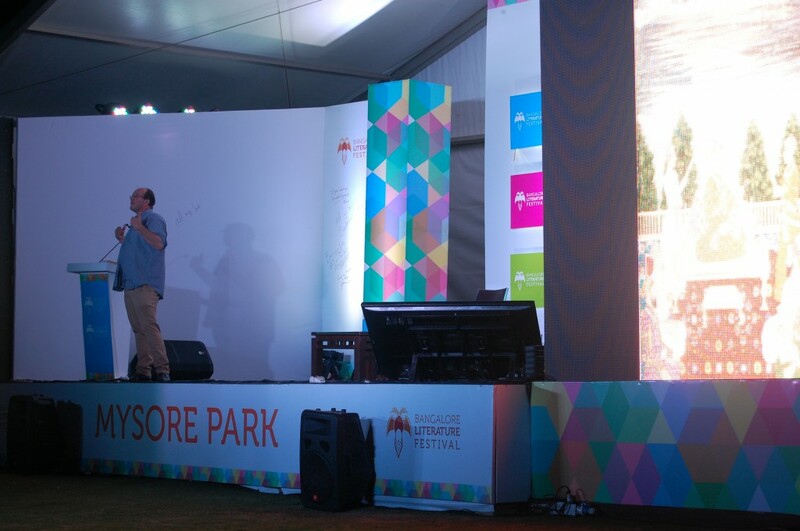 On the stage, titled Mysore Park (a playful take on “Mysore Pak”? ), were three popular figures, all part of a recent inarguably wonderful, inspirational biopic on one of India’s famous athletes, Milkha Singh. As Rakeysh Mehra, Prasoon Joshi and Farhan Akhtar bat questions from both the moderator as well as the audience, I forget that I have come to attend a literature festival and not a film festival. At the end of the session when I look at the festival brochure, I realize that while the session was to be on whether “Indian cinema has finally woken up to bio-pics”, it was the only thing the session did not address. I look up from the brochure again and find that more than three quarters of the crowd had already moved back to the comforts of their IT offices. 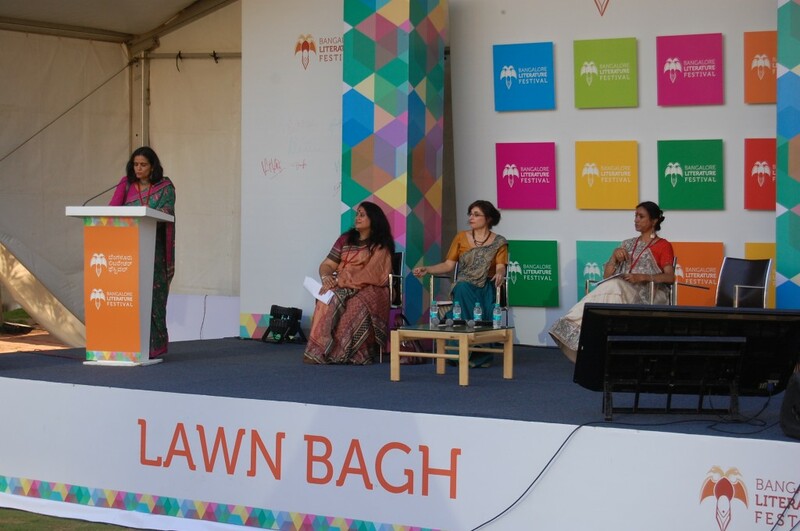 I head hurriedly to the other venue of the festival, Lawn Bagh (another play of words on the city’s famous botanical garden), to attend a session on Crime and Fantasy fiction. Much of my time at the festival, I later figured out, was spent on moving between the two main venues, undecided on which session would be more promising and rewarding. Simultaneous with the Crime and Fantasy session, another session went on in the Mysore Park venue, discussing “literature” related to fashion. After peeking in at both the sessions – both running late, probably due to the film event earlier – I decide to stick around the food court and try out some of the wares. Food quality and neatness of premises had greatly improved from the 2012 festival. So had the lineup of options, which included beer for those who liked some on warm afternoons. The venue, far though it was from the rest of the madding city, was a good choice in terms of ambience and comfort. It did not have the presumable appearance of an IT Park. The Office Buildings and the Crowne Plaza Hotel in the vicinity, were camouflaged well enough to make one feel at park, rather than at IT Park. During the weekend, several families visited the festival, bringing along children, as if on a picnic.The children might have found it a good learning experience. I discover this when I overhear a parent explaining to her child who the old man (Gulzar) on stage is after a lilting session of music and lyrics which lasted more than 90 minutes. In three days, there was little that I learnt about literature. There was much more to learn than literature though, such as Dalrymple’s explanation of the death of miniature art after the Mughal period owing to a feeling of inferiority which the Indians gradually acquired when the British came visiting. The notable sessions of the event included those with Gulzar, William Dalrymple, Ramachandra Guha, Govind Mishra, Tilman Rammstedt and probably a few more which I happened to miss during the runnings in between. Literature festivals have a way of being in the news. You hear about it much before it happens and there are mentions of it much after it has gone by. That is so at least in the country I live in. Not the Bangalore Literature Festival though. There was no sensationalism here nor controversies. 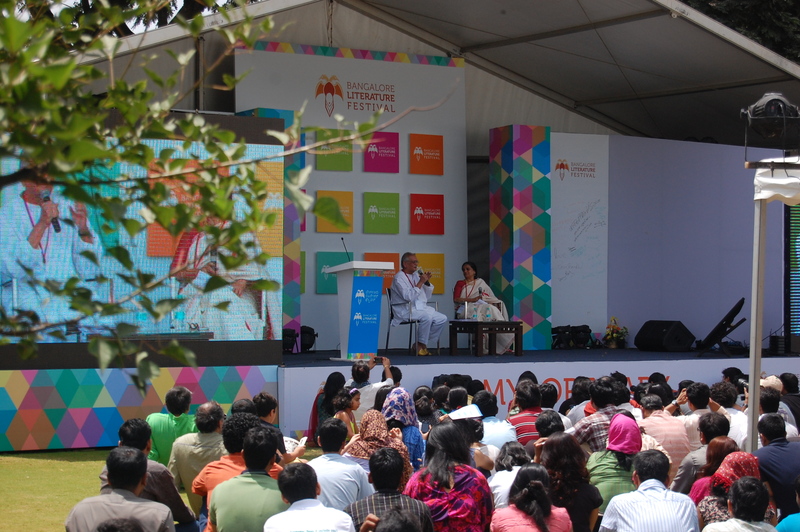 This was a literature festival wannabe, and it maintained that frame in all its humbleness. There were no attempts to break out of the typical recipe of what a literature fest should include. Movies, music, culture and arts had its share of space here along with literature. For some or most, this would work just fine and that is where the Bangalore Literature Festival succeeds. The credit for putting it together and carrying it through goes to Vikram Sampath, Srikrishna Ramamoorthy and their team. My message on the postcard – Best wishes to BLF for carrying yet another edition of the annual festival. We hope for a bigger and more ambitious third edition in 2014. Suhail Rasheed is a management consultant and writer based in Bangalore.